Consider purchasing a wood sewing machine cabinet or table. When you purchase all wood sewing machine cabinets and tables, you are buying furniture that should last through several generations. For many people, the term "sewing machine" brings back memories of a grandmother's foot-propelled antique machine. The machine itself was probably a Singer or some other sewing machine brand that has been around for generations. It may have been etched with gold writing and exhibited the elegant look that still commands top dollar for antique sewing machine collectors from around the world. These machines typically still have their original cabinet or table, and most of them were made of wood with iron supports. Why have they lasted? No doubt, it is because of the sturdy materials from which they were constructed. While today's machines have certainly taken a turn from the almost ornate models of the past, all wood sewing machine cabinets and tables continue to follow the sturdy construction of their predecessors. Once you've been bitten by the sewing bug, you may find yourself enthusiastically searching for the perfect sewing machine. You can find machines for under $100, or you can find a machine with all of the bells and whistles for several hundred bucks. Keep in mind, however, that the inexpensive models are tabletop machines. Although their portability is convenient for storage, they simply won't last as long as a machine encased in wooden housing. In other words, you get what you pay for! 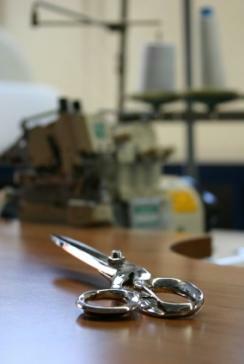 Sewing Machine Stores: Check your phone book or online directory for listings of sewing machine suppliers. Many times these dealers take in used machines on trade. You may be able to find a sewing machine with a wood table or cabinet for a fraction of the cost of a new one. You should ask if the model you are purchasing has been serviced, as well. If not, consider having it serviced before you leave the store. Classifieds: If you haven't checked out the miscellaneous section of your local newspaper, you may be missing out on the perfect machine! One man's trash could be your treasure! Online Auctions: Sites such as eBay offer sewing machines, cabinets, and tables. Online Classified Ad Communities: Places like Craigslist allow people to post items wanted and items for sale. You can search for free! Antique or Thrift Shops: Antique or thrift shops may have sewing machines in wooden cabinets or tables that date back only a decade or so. They may not be true antiques, but they're still great bargains. Again, once you've purchased your machine, take it in to be serviced.